Workflow information will set the base for operational support by definition of test cases, benchmarks, and validation concepts. In addition, a methodology is being developed in order to transfer a specific problem description into a simulation setup for surgical training. Goal of this project is to develop an advanced engineering concept that supports assessment of workflow processes in the medical environment and to use this information for a variety of additional process steps. This project is designed for support of all other research projects within ACMIT by implementation of methods and tools for a structured development process. Basic idea of this project is to connect the workflow description of the surgical task with a generalized methodology for design and realization of a particular training setup. A careful and complete description of the surgical workflow can -among others- serve as a check-list in the operation room (OR), taking care that all different steps during the surgical procedure are taken at the right time in the right way. Research results reveal that OR complications are less frequent when such surgical check-lists are being implemented. Also the use of simulators and training systems has a clear impact on efficiency and safety. New techniques and tools can be tried out in a more systematic way, key situations can be practized in an interactive manner, and finally the learning curve can be shortened. With the introduction of such training systems, especially in combination with real patient data, a particular surgical situation can be examined before operation takes place. 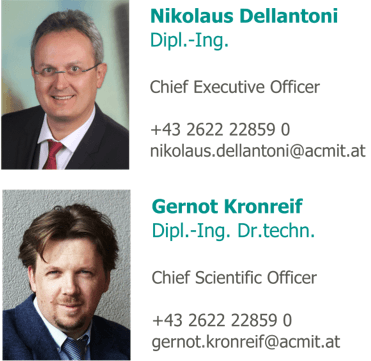 By research on workflow optimization and skill transfer, ACMIT contributes to improved efficiency and reduced trauma of minimally invasive procedures.